Upon its initial introduction, margarine was widely hailed as a healthy alternative to fat-laden butter. With less than half the saturated fat of butter, margarine seemed the clear winner for people trying to lower their cholesterol and improve their heart health. But it was soon discovered that margarine had adverse health effects of its own. In the debate between butter and margarine, neither one is an ideal food, but if you know what to look for, it's not hard to decide which is best for your body. Butter is made from dairy, which means it's rich in saturated fat and dietary cholesterol, both of which can raise your levels of unhealthy LDL cholesterol. 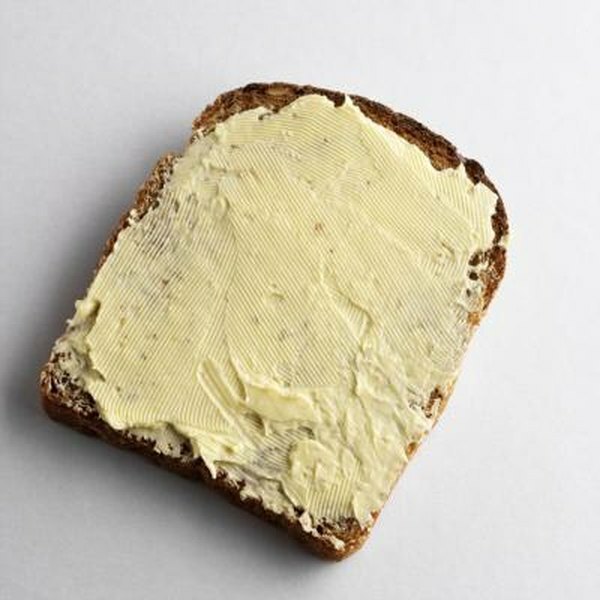 Just 1 tablespoon of butter contains 33 milligrams of the daily recommended 200 milligrams of cholesterol, as well as 7 grams of saturated fat, which should be limited to 10 to 15 grams per day. Butter is also high in calories, due to its high fat content. Traditional margarine contains less saturated fat than butter, but it's high in trans fat, a type of fat known to raise bad LDL cholesterol while lowering good HDL cholesterol. However, margarine has come a long way since its introduction, and some varieties are now lower in saturated fat, high in unsaturated fat and free from trans fat. The calorie contents of different margarine varieties vary widely, with some containing less than half the calories of butter, and others the same amount as butter. If fat is your biggest concern, your best bet is to choose a liquid margarine or soft margarine spread over butter or stick margarine. More solid margarines contain more trans fats than softer versions, like tub and liquid varieties. However, it's still important to read the nutrition labels on margarine tubs to see how different varieties compare. Look for one that's trans fat-free and contains no more than 1 gram of saturated fat per serving. Beyond that, choose margarine that's relatively low in calories. Most supermarkets also sell vegetable oil-based spreads, which have heart-healthy fats, as well as stanol-based spreads, which are a good choice for people trying to lower their cholesterol. Many people keep both butter and margarine in the fridge. Depending on how you eat them, one isn't always a good substitute for the other. If you find that the taste of pasta, rice or toast made with margarine just can't compare with butter, look for whipped butter or butter blends, which have the taste of traditional stick butter but contain fewer calories and fat. Real butter is almost always the best choice for baked goods like brownies and cookies, but oils like olive and vegetable are a common substitute for butter when cooking, since they're lower in saturated fat.